History and tradition are embodied at the dreamy and romantic Grand Hotel Tremezzo located on the revered Lake Como. Guests of this art nouveau palace can choose between park view, lake view, rooftop or historic suites. All guestrooms feature breathtaking views and are luxuriously appointed with elegant and classic Italian furnishings flooded with sunlight. 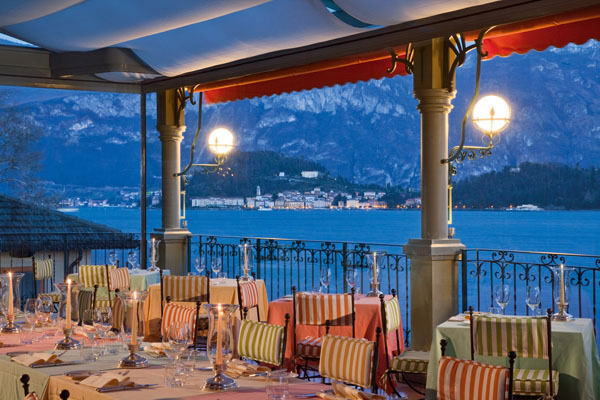 Aside from the beautiful nature surrounding Grand Hotel Tremezzo, there are five restaurants and bars located in the hotel, each with their own specialty. 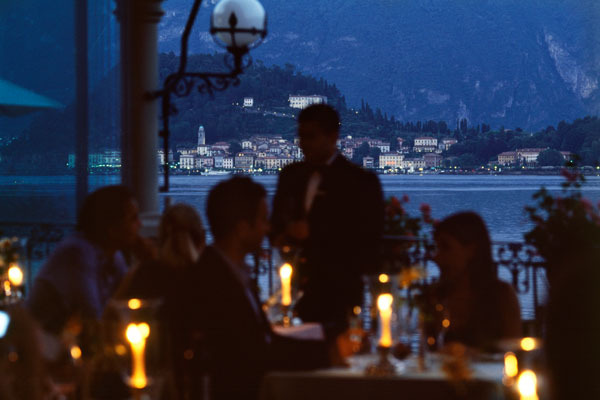 The most romantic is La Terrazza perched on the expansive terrace with stunning views of Lake Como where the divine cuisine is only matched by the magical atmosphere. The highlight of this restaurant is explained in a few words: Maestro Gualtiero Marchesi. Together with Grand Hotel Tremezzo’s Executive Chef Osvaldo Presazzi, they create an unforgettable dining experience offering the finest and tastiest examples of Italian cuisine. La Terrazza’s menu changes with the seasons to take advantage of local produce creating traditional dishes enlivened with a touch of creativity. At sunset, the rose tinted Grigne peaks and the twinkling lights of Bellagio offer a sight no guest can ignore. The saffron gold risotto at La Terarazza is adorned with an edible gold leaf – a must-expereince dish. The “riso, oro e zafferano” (literally – “rice, gold and saffron”) was born in 1981 and is considered by all critics the first real gourmet dish to appear on the menu of an Italian restaurant, thanks to the creativity of the absolute genius Gualtiero Marchesi that just 4 years later gained, thanks to this dish, his third Michelin star – being the very first Italian chef to obtain this important recognition. The “riso, oro e zafferano” has then been the signature dish of Marchesi on his restaurants’ menu since that moment, for over 30 years. Since 2014 when Marchesi closed his historical restaurant in Erbusco to move to Milan, the “riso, oro e zafferano” has been served exclusively at La Terrazza. L’Escale is a top-notch Fondue & Wine Bar and the first and only of its kind on Lake Como, where your delectable meal is cooked before you in the middle of the table. .New this spring, the hotel has unveiled a completely renovated and expanded L’Escalewith new unique culinary offerings including a Chef’s table and garden. 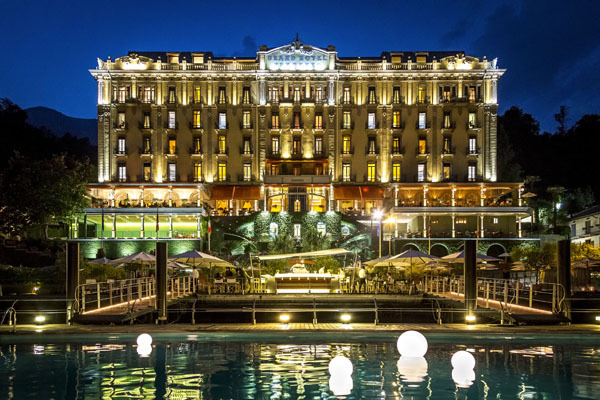 During the warmer months, T Beach is the place to be with its prime location by the hotel’s floating swimming pool over Lake Como serving gourmet delicacies. For an aperitivo or night cap stop by T Bar or T Pizza to enjoy innovative cocktails under the moonlight or casual Italian fare. However, Grand Hotel Tremezzo is not only about excellent food, but breathtaking experiences, as well. Therefore, the hotel offers three different pools, including the floating swimming pool over Lake Como. The Flowers Pool is embedded in a beautiful garden that feels like the Garden of Eden and the T Spa Infinity feels like heaven with its zen like calmness offering eternal relaxation. Take an exhilarating dip in the cool waters of Lake Como or sunbathe at the private T Beach with panoramic views extending to Bellagio. Take the charming towns dotting the lake by private boat, as Grand Hotel Tremezzo has recently revealed the addition of a brand new marina in conjunction with the introduction of Batt, a luxurious, tailor made boat exclusive to the hotel, allowing guests to full embrace the natural beauty of Lake Como. Keeping family tradition alive, the iconic Lake Como property owners have done something no other property has done. Opening their arms to welcome a new property to the family, now managing Villa Sola Cabiati, a historic Lake Como landmark. Villa Sola Cabiati, the beloved summer residence of the Serbelloni Dukes, has passed to the Counts of Sola Cabiati and their heirs through marriage, but until now it had not changed hands since opening in the 1500s. The Villa will be used to host elaborate weddings, romantic dining experiences and exclusive events reserved only for guests of Grand Hotel Tremezzo. Luxury, inspiration and innovation are embodied at the Grand Hotel Tremezzo for an unforgettable vacation where dreams do come true and you will be treated like royalty.